In my career, I’ve been through thousands of product demos on both sides; presenter and prospect. I’ve experienced a potential client share my enthusiasm for a product solution creating the “demo high”, and I’ve also sat through those awkward moments where the people around the table are non-reactive. 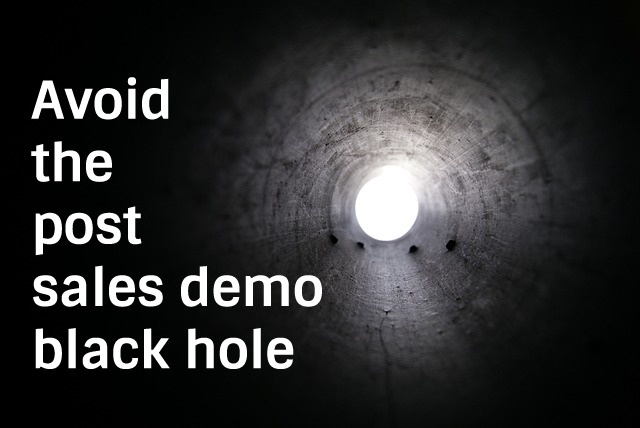 All too often, despite executing the same sales process, the outcome of both scenarios can lead to the post-demo black hole. You know what I’m talking about - when the opportunity goes completely silent leaving you to question, "What happened?" So why do some opportunities follow your process exactly while others take a different path? The answer is simple: unless your sales process aligns directly with the buyer's decision journey, then your process is just an internal checklist that may or may not indicate anything about the customer. So when it comes time for the “demo stage,” if the customer is also ready to compare solutions, you get lucky - your sales process works and they buy in the forecasted timeline. If they are not in the same place, then timelines get pushed, decisions get delayed, and you slip into the dreaded post sales demo black hole. 1: Where is the customer in the Buyer's Decision Process? Aligning the Buyer's Decision Process with your sales stages is an entire topic all to itself but to keep it simple there are two potential reasons why someone is attending your demo and each scenario requires a completely different demo strategy. Understanding this distinction is crucial and should be determined before you schedule the demo. Scenario A: They are among 3% of the market who have experienced a change, they can articulate what has disrupted the status quo and communicate what they are trying to fix, accomplish or avoid. Scenario B: They are in the 40.5% of the market where the forces at play have made them susceptible to changing the status quo. 2: Is this an early or late stage demo? If the customer is in the 40.5%, you can assume its early stage and your focus should be educational. Add value by helping them further define the problem and evaluate the impact of staying in the status quo. It may also be helpful to suggest factors they may want to consider when comparing solutions should they decide to make a change. If you decide to continue to engage with customers in the 40.5%, you must be okay taking the risk that now may not be the right time for this customer or your solution may not be what they need. A customer in the 3% is a little trickier. Although these buyers can articulate the change that has occurred and what they are trying to fix, accomplish or avoid, they may still be struggling with defining success and how to compare potential solutions. If that’s the case, your demo will need to be educational not product feature based and since the customer has volunteered more information about themselves, you have the opportunity to customize. However, with a customer in the 3% you may also realize each person at the table is in a different stage. Some may know exactly what they need and how to compare while others are still trying to figure that out. This requires a hybrid demo- including educational components specific to them, as well as elements of a competitive demo. What buyer role does each person play and why do they think they are in the room? What key questions is each person trying to answer? Are they trying to educate themselves or compare? What is the key decision maker trying to do? 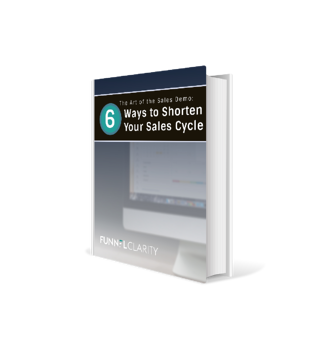 3: Would the customer pay for your sales demo? No matter what kind of demo you are doing, first ask yourself would the customer pay for the value you add during the interaction. If you give the same demo over and over, where you are talking 75% of the time and you can recite the talk track in your sleep, it’s time to question how valuable the demo is for the customer. Studies show that people have an attention span of 10 minutes. If you aren’t stopping to engage the customer and get their reaction, consider starting immediately. However, it’s important to avoid the question, “Are there any questions?” Instead, clarify their understanding by connecting specific aspects of what they are trying to solve with your solution. Perhaps ask them to verbalize how particular aspects you have demonstrated could change the status quo. People respond to stories about their peers, so be sure to include any relevant experiences that may add value. Remember, differentiators and decision criteria are not always about cost, product or service. The seller is often the most important differentiator. Interested in learning more about how to build these steps to your demo process?